Help all employees experience, first hand, the critical role respect plays in ensuring compassionate and effective healthcare! 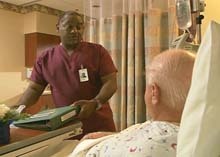 This compelling program immerses participants in a unique learning experience that explores how unconscious mindsets and hidden biases impact both patient and coworker interactions. It outlines a straight-forward protocol that can be used to help avoid or resolve situations before they negatively impact quality of care.